Tonsil Stones, also called tonsilloliths, are caused by a buildup of sulfur-producing microorganisms and food fragments that become stuck in the tonsils. When these fragments mingle with the Volatile Sulfur Compounds created by the anaerobic bacteria under the surface of your tongue, they can generate chronic halitosis and stones. They can also be the cause of sore throats. Though to be sure, take a look at some of these sore throat remedies as well. Tonsillectomies become progressively more risky as we get older, but excluding that, even if you have your tonsils removed, you will most likely still have bad breath, thanks to the bacteria in your mouth. 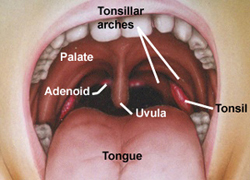 The tonsils are lookouts, standing guard at the rear of the throat to defend the fragile tissues of our lungs and intestines from foreign invaders. Many times, tonsil stone care isn’t even necessary. Most people swallow the debris without even noticing it, while it is still tiny. They are quite common however, and most people who develop them have no associated symptoms. Here is the starter kit I used to eliminate my tonsil stones for good. More then anything, tonsilloliths are mainly little more then nuisances. Some people cough them up when they’re dislocated from the tonsils. If you’re not so lucky, there are other methods. Removing them is tough, but it can be done. You can try to do it by dislodging them with your toothbrush or a finger (ouch)! Another option is to use a Q-tip. A last method is flushing them out with a water pik, which is a pressurized dental irrigator. The water pik can also be used to get food stuck in tonsils, and rinse food particles from between the teeth. This is said to work better than flossing. There are also special sprays and nasal drops you can use to prevent them. 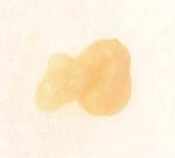 Tonsil stones are typically white, or whitish-yellow, irregularly shaped, foul smelling, and usually smaller than a pea. You may also have a white tongue to go along with them. If you want to know hot to prevent tonsilloliths and the bad breath associated with them, you should use an oxygenating toothpaste and mouthwash, and a tongue scraper to effectively neutralize the anaerobic bacteria at the back of the tongue.